Machine pieced cot quilt made from squares of material including tweed, wool, blanket and pyjama material. The squares are joined in rows with colours randomly placed. There is a pink satin edging. The backing is part of a pale pink blanket. This cot quilt was made by Doris Rattay in the Barossa Valley of SA in 1963. It was made from second hand materials that would give warmth, including parts of old skirts and blankets. Doris donated it to The Pioneer Women's Hut. It is displayed occasionally at the museum. Hand sewn quilt (possibly child's or table top) of crazy patchwork in silk, silk ribbon and cotton velvet. The top has surface decoration of embroidery on all seams, feather stitch and blanket stitch variations. Many of the crazy patches are also embroidered. The centre patch has a rooster embroidered in lame thread. Embroidered motifs are hearts, butterflies, guitar, cow, Little Red Riding Hood, horseshoes, crown, clover leaf. Stitches are feather, stem, satin and blanket. Embroidered initials are 'B', 'R', and 'S'. The backing is dark grey silk. Quilt made from furnishing materials, mostly velour type or uncut moquette. The colours are dusty pinks and beige/camel/blue. It has been put together by making wide strips of various sized rectangles sewn together and any missing piece in a rectangle added by using another piece of material to complete the shape. There is no padding and the backing is winter cotton. Large double sided quilt of rectangles and squares of men's suitings, patterned and plain on both sides. The top has a central motif of a circle of three segmented rings radiating from a single hexagon. The outer ring is all tailors' samples and the inner rings are a variety of materials. There is some featherstitching in red. The quilt is sparsley machine quilted. 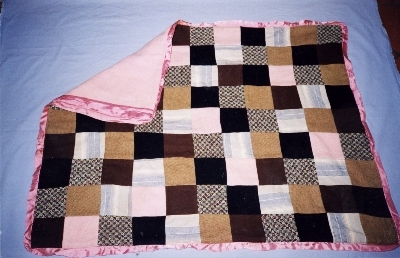 Utility patchwork quilt made up of mainly squares of furnishing material machine pieced. It is backed with machine pieced patches of woollen jumpers, mainly machine not hand knitted. The back is possibly the top. There is no padding.